It's unanimous, the Alabama Crimson Tide are national champions. Wait, they aren't? No, they aren't. The Tide has just successfully defended their top ranking this past week, something the Longhorns, Trojans, and Sooners all weren't capable off throughout this season. So after Nick Saban has led his team to a 10-0 start with road wins in Death Valley, between the Hedges at Athens, and in the Bayou against the Tigers, he's yet to capture anything. No postseason birth, no BCS bowl game, and certainly no championship trophy. Just a 10-0 record with their destiny entirely in their hands. Now maybe I'm the only one who finds a problem with this, but after then Senator Obama and now President Elect Obama states on Monday Night Football that the thing he'd most like to see improved in sports is the way we determine a college football national championship, I'm guessing I'm not the only one. In fact, after last Tuesday night, I'm positive I'm not the only one. Boise State 9-0 Play somebody. Maybe it isn't your fault that teams won't schedule the dangerous Broncos of the blue field, but blow outs at New Mexico State and Utah State don't do much for me. Detroit Lions 0-36 Sure, it'd be funny to see an NFL team get taken to the wire against a major top flight collegiate program, but it wouldn't be good for anyone. Especially the Lions. Ohio State 8-2 It'd probably be different if you played USC again, but they'd probably be ranked #1 if they got another crack at Oregon State. I still don't know how the Big 10 has two top ten ranked teams. Missouri 8-2 I find it very wrong that they will play for the Big 12 Championship, I'm guessing the Red Raiders, Sooners, or Longhorns will eventually have a problem with it as well. Ball State 9-0 Your not convincing anyone with Miami of Ohio, Central Michigan, and Western Michigan rounding out your schedule. 12-0 and a first class ticket to the CarQuest Bowl. 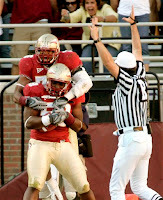 Florida State 7-2 You wouldn't want to witness Bowden v. Paterno in Round 1? FSU has easily been the most consistent of the ACC Atlantic Division teams at 7-2 and if not for a late win by Georgia Tech in week 8, their 8-1 and ranked among the top 15 in the country. Florida State is my personal message to Urban Meyer, don't sleep on the 'Noles. 8. Utah Utes 10-0 I'm accepting offers for this final slot in the tournament. The Utes get in on record alone, they've got ten wins including the recent comeback victory against the Horned Frogs of Texas Christian. They've beaten Oregon State, won at Michigan, and will play BYU in their season finale. Sorry, I can't even include that win against Michigan, even the Irish handled them. Utah is the lone team from the Mountain West getting any respect from me, and if they lose to BYU, none of them are in. JUST SO WE CAN BE CLEAR. 7. Penn State Nittany Lions 9-1 The world just isn't fair. Destined to be left out of the national championship game, despite an undefeated record, that is until the Iowa Hawkeyes decided to set the BCS back on it's axis. The Nittany Lions beat their conference rivals on the road, (Ohio State in Columbus) handled the same Oregon State team that knocked off the Trojans, and of course beat the Badger out of Wisconsin in Madison. The downfall is, they don't play a conference championship game, oh and their conference is soft. However, a mobile quarterback with a strong arm in tournament play spells danger for slower defenses. 6. Oklahoma Sooners 9-1 They had their shot to take this thing by the proverbial balls. A one and done shot at the Texas Longhorns on a neutral site, the Cotton Bowl, and they blew it. Big Game Bob Stoops did what Big Game Bob Stoops does, choke. Lucky for him, this is America and if they take care of business against Texas Tech in week 11, they'll play themselves right back into national title contention. A playoff would tell us how good the Sooners really are. 4. Southern California Trojans 8-1 This defense allows just six points per game and since their shocking upset loss to Oregon State, they've outscored six opponents 231-23. A hiccup in Oregon puts them out of reach in the current format but in a 8-team playoff, SC would really be tested. This defense putting pressure on the likes of Colt McCoy, Graham Harrell, and John Parker Wilson, anyone else think they aren't qualified enough? About that 27-21 loss to Oregon State; the points the Beavers scored in that game account for nearly half of the point total the Trojan defense has allowed ALL SEASON LONG. Look out Notre Dame, look out. 3. Florida Gators 8-1 Their one loss makes them the best of the one loss teams in Division 1A college football. The Gators led by Tim Tebow are the class of the SEC, they beat LSU when the Tigers were ranked as high as #4, 51-21. Two weeks later they arrived in Athens, Georgia before quickly dispatching the Bulldogs, 49-10. Their loss comes on a missed extra point against 'Ole Miss back in week 4. However, out of the woods they aren't. Florida has remaining games against South Carolina, which has always proved to be difficult for Meyer and the Gators, and of course Bobby Bowden and the Seminoles, followed by Alabama for the SEC title. If we had a playoff, this team would be in, since we don't there is a very good chance they could be out all together. 2. Alabama Crimson Tide 10-0 I'm not ranking them #1, and I'll tell you why in a second. The Crimson Tide have possibly the three biggest road wins in big time college football, in Death Valley to open the season against a Clemson team that had more hype than any ACC speed program, at Georgia when the 'Dawgs were ranked 3 in the country, finally the most recent victory in the Bayou against an LSU team with a hundred thousand screaming fans after Nick Saban's head. Any questions? This team is on a crash course with Florida to determine who is playing for the crystal football. A game for the ages. 1. 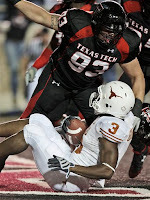 Texas Tech Red Raiders 10-0 If a playoff started today I'd make this team the top seed for one simple reason. THEY BEAT THE NUMBER 1 TEAM IN THE COUNTRY ALREADY. That isn't to say that 'Bama wouldn't have taken it to Texas but they didn't get a chance and when the Red Raiders did, they won. Harrell and Co. followed it up with a convincing victory over a one loss top ten ranked team in Oklahoma State. Bottom line is, if Tech wins out they deserve a title shot, this isn't Boise State or Utah who plays in lesser conferences, the Red Raiders play in the Big 12.
Who doesn't want to see an 8-team playoff or some form of it? I've outlined who would make up a tremendous postseason in college football and it's difficult to argue with. Three teams from the Big 12, two from the SEC, Trojans, Nittany Lions, and your darling story in Utah. Again, I can't stress how exciting this would be.